MCM Comic London happened last week: The event’s doors opened on the 27th and closed on Sunday 29. Through this post, I will introduce you to the event, its content, what happened during these three days and of course how well Veterans Online did in the Indie Game booth. What is MCM Comic Con? 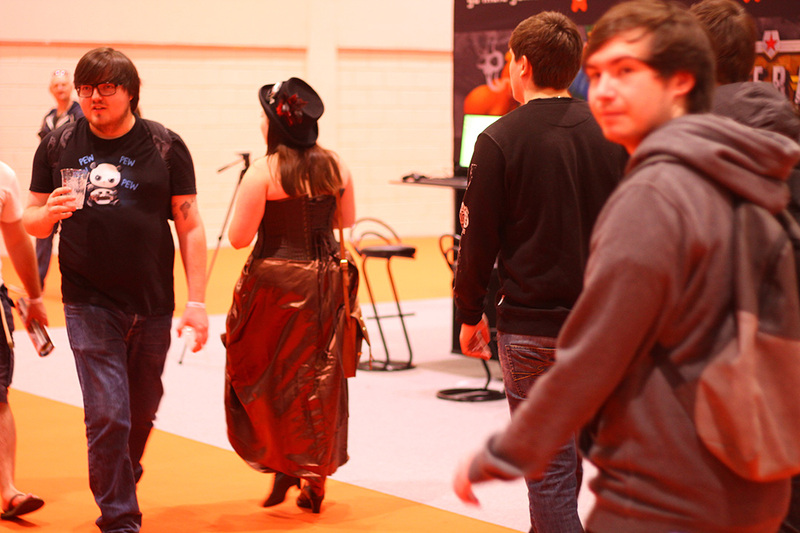 The MCM Comic Con is the biggest convention for modern pop culture. 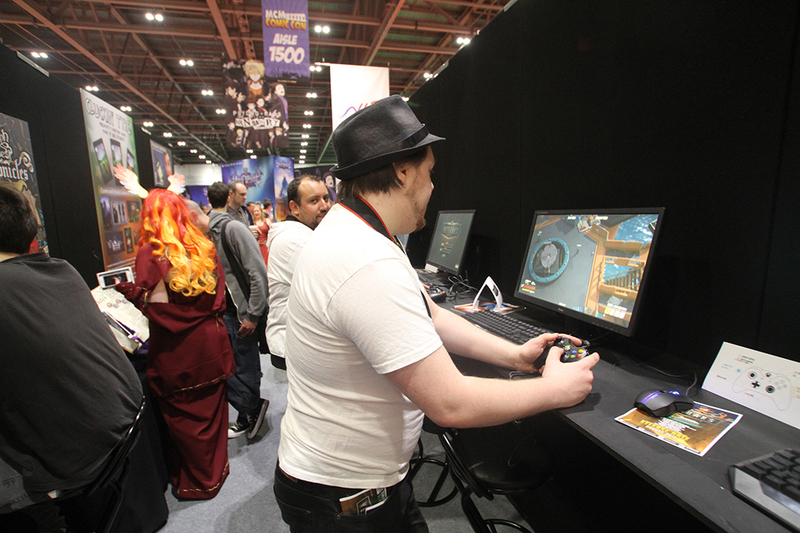 It takes place in London twice a year, and gathers fans from all over the world to attend a gathering of comic, anime, manga and video games. The main events are cosplay competitions, video-game shows, featured guest stars from the entertainment’s scene and multiple awards in different categories. Also, a kind of a village where comics are sold to the public in one big room and where writers hold signing sessions and autographs. For the next questions, I will be quoting our CEO Aron, who attended the event with a small team, to represent the studio “Nuked Cockroach” with Veterans Online in the Indie Game booth. “Tayara”, said Aron, which is an Arabic word for “excellent” or “epic”. 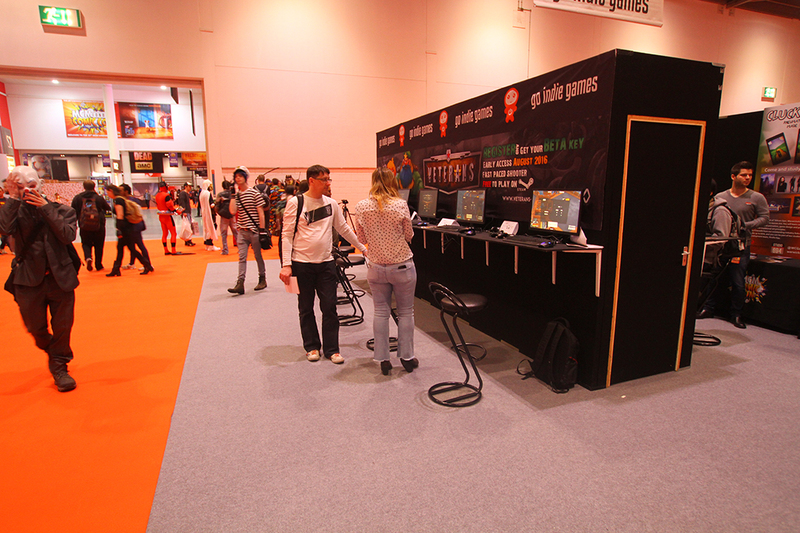 Indie game booth, where all the awesomeness happened? How was it? The event had a booth dedicated for Indie games. Veterans Online was part of the booth, with the excellent team of “SMAC” presenting their game “Tokyo42” and some other games. We were placed near one of the entrance, just next to Bandai Namco’s and Overwatch’s respective booths, yet, ours was always busy. “Seeing everybody rushing to test your game” was Aron second best moment of the event. You feel their joy while waiting in lines to play the game and watching other players die and kill each other. How did the players perceive Veterans Online: the first impressions? For the first day, people did not know the game and what was it: they came in curious and started playing. What we first noticed is that people did not want to die, they were running in the map trying to avoid killing or getting hit. Until they got acquainted to the controls, and here all the fun started. “Laughing at the player they owned or laughing at how they died, this was the constant reaction on testers’ faces.” As a solo player, you will keep challenging other players, by killing them multiple times. But once you have teammates, a more developed gameplay appeared: they become more organized and mastered the tactical aspect of the game: “ We sometime felt that, these organized –gangs- were overpowered for the other players, we had to join the game to make it more balanced”. The casual gamers liked the close-ranged fights using knives and grenades, or setting up traps and mines to kill the others. They loved the art of the map, the interactions and the animations. They kept finding hideouts, or choosing small bridges to fight on. The fun aspect was their hook to the game. What was the feedback about the game? Since the game is still in development phase, we gathered a lot of feedback: some of it we already had in mind and working on it, and some new feedback that we are going to consider. Mainly, the game controls was the main concern for players and ours: Using both sticks on the controller to move and aim was not something easily mastered by players. We are currently working on making the aiming more smooth and flexible. The second feedback was related to the health pool of the characters in the game, players found it too low, and wanted to be more resistant to bullets (they suggested the implementation of Kevlar jackets). We took this in account, and we are willing to find solutions that we can make available for our players. What is the most important aspect that we need to work on for the next step? We will try to develop the fun aspect the game, by creating more interaction with the maps, weapons and other players. In the same time, offering tweaked gameplay for the competitive aspect: by developing the tactical aspect and rewarding smart actions in the game. Still, when we asked both type of players if they rather see a “Water Gun” or “Silenced Gun”, both chose the Water Gun for the fun part that it can add to the game.